Tenders are used to transport passengers to the island where locals greet you with twisted plant headgear for each passenger. Here you may find a few available taxis, if you would like a look around the island. 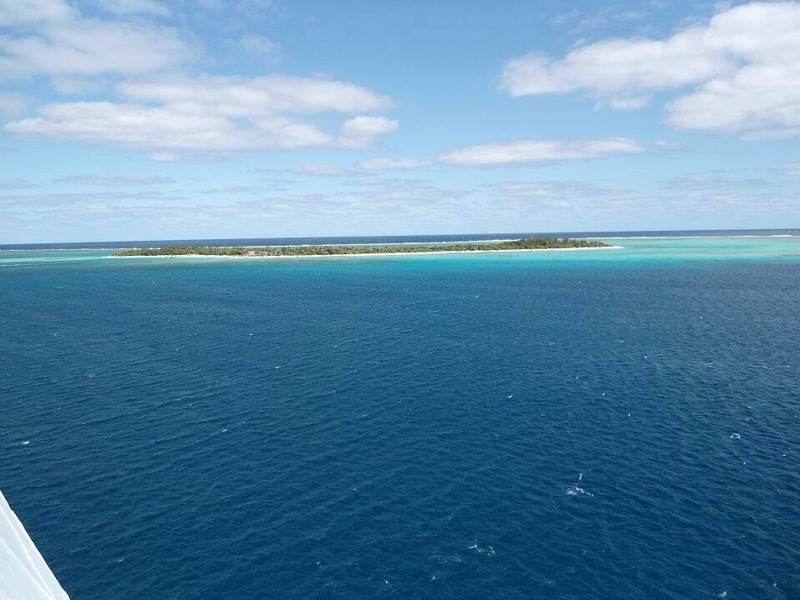 Water surrounding the island, is beautifully clear, providing ideal snorkelling areas. For the best snorkelling, closest to the wharf, take a stroll down the road, past the markets, to the rock. Here, you have a relatively sheltered area, with some fantastic fish to see, especially up close to the Rock. Keep in mind it is taboo to climb onto the Rock. As always it is important to respect other cultures and beliefs when in their country. There are a few market stalls, enough to purchase your trinkets without having to much choice. They certainly help to give you a leisurely stroll back to the wharf. AUD are accepted here as well as local currency. Enjoy the snorkelling- you never know who may be watching ! As your ship cruises into the bay, you will spot the lonely white church atop the point of the island. 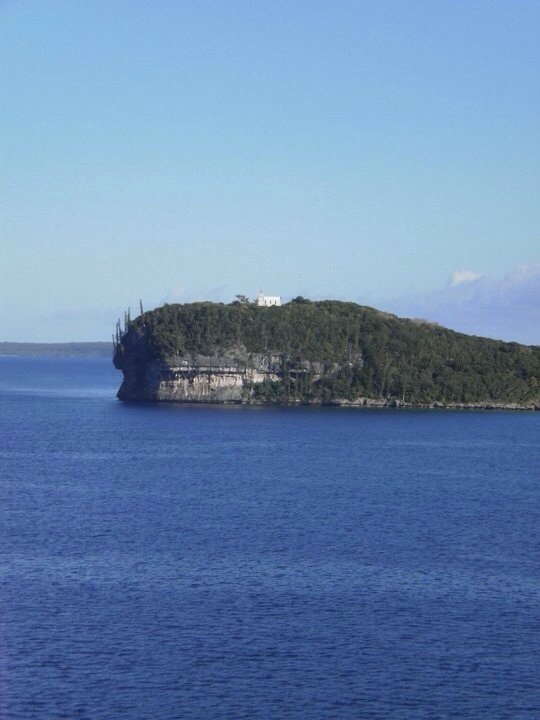 Shortly you will hear the anchor drop as the ship starts the process of disembarking passengers to head over to this uplifted limestone island. Pretty. 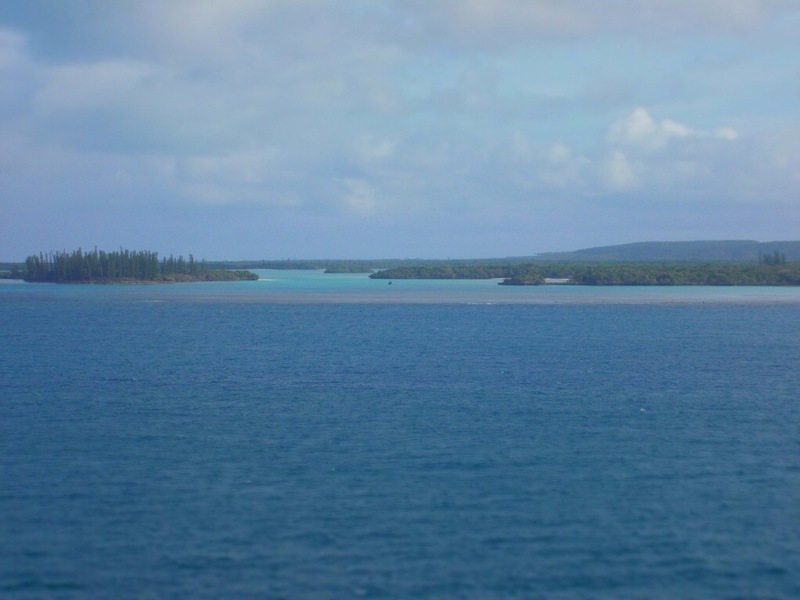 This is the word I have most often heard people use to describe Lifou. (Lifu). Tenders transport passengers across to the island. The wharf is over a beautiful beach area where snorkelling is popular. 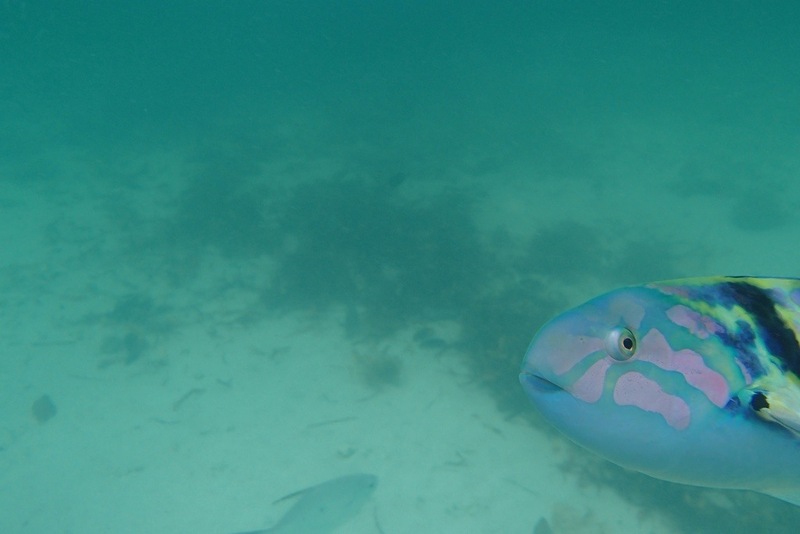 Here there are some colourful fish, and if you are in the right place at the right time, you could swim with large turtles who inhabit the bay. 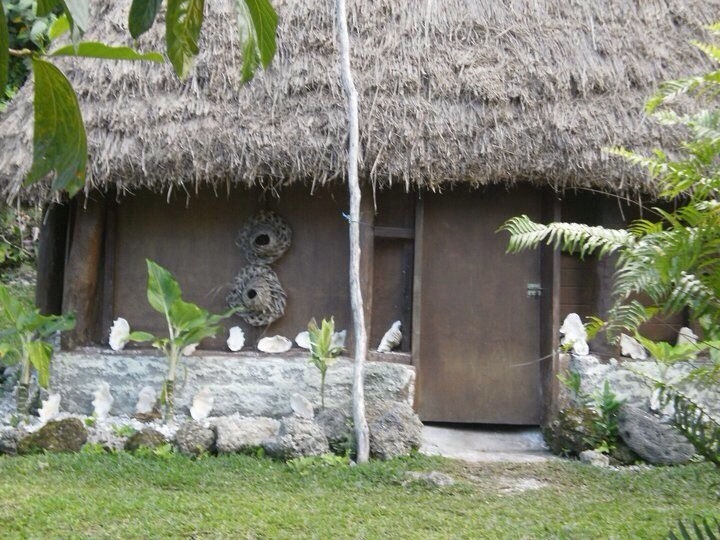 The village directly off the wharf, contains a cluster of thatched native huts. Vibrant markets full of locally made and other trinkets, take up a large partially enclosed area. Hair braiding, local foods and other activities are also on offer. From the dock area you can walk to different areas close by. Keep in mind that although you will see mini buses etc as you land, these are pre booked for tours and your chance of finding a driver to take you around the island would be slim, if at all. The church and snorkelling bay on the other side of the point are a relatively close walk, not flat however with some uphill walking involved. 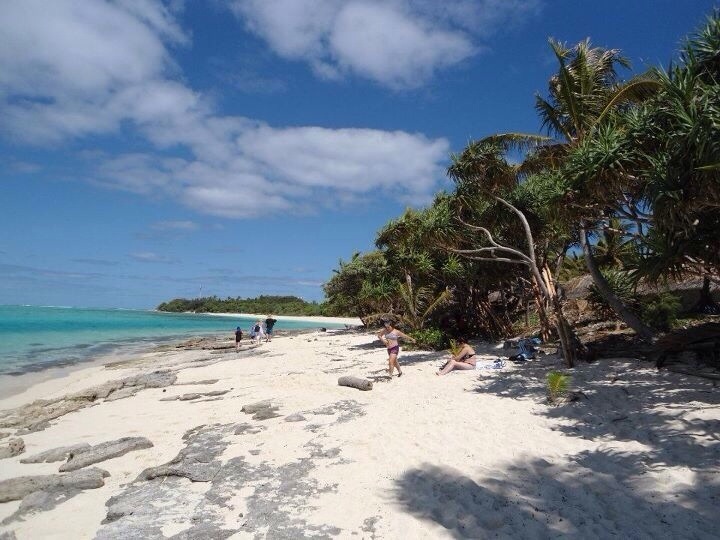 As with any of the island stops, there are a variety of tours which can be prebooked. 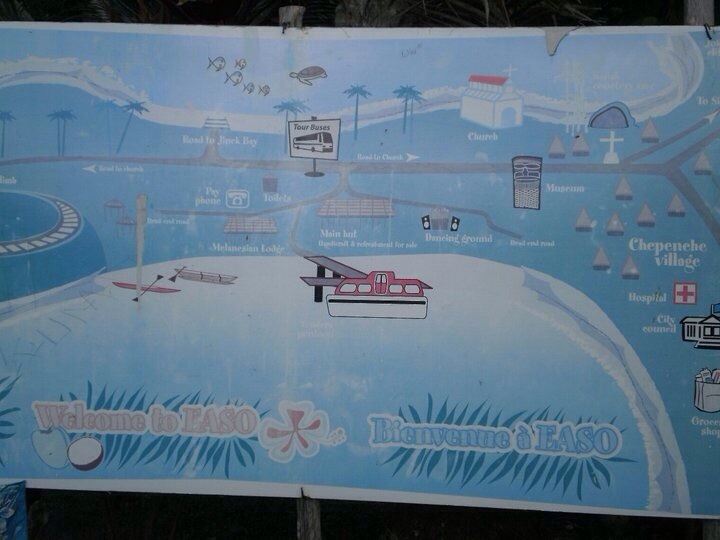 This is the only stop where we have prebooked a tour, to the Vanilla Farm. This one was definitely worth booking and hence a post with write up on the tour will be published in the next couple of days. We did speak with a family at the wharf, prior to boarding the ship, who were very disappointed after having booked a swim with the turtles, which was not cheap. Unfortunately on this day, they never saw a turtle on their tour. However three large turtles appeared close to the wharf, casually feeding as they cruised around the bay. Somewhat bitter sweet for this family who did get to see turtles, without needing to pay. 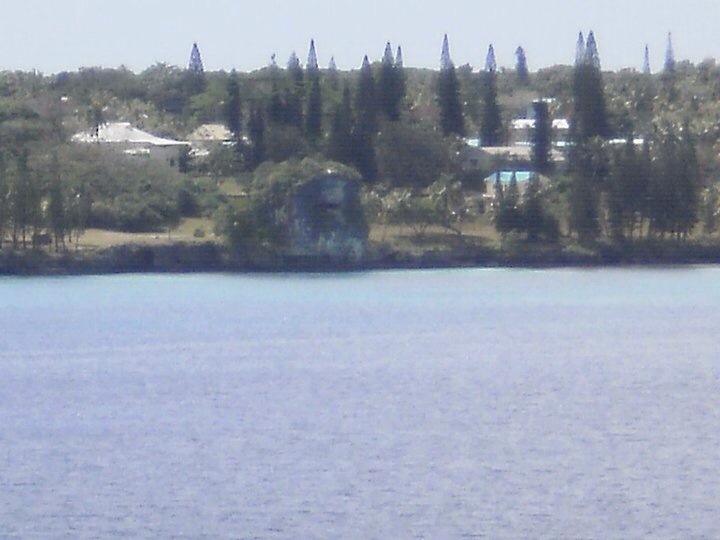 Keep an eye out for this whale like point topped with a church, on your cruise, it means you are about to drop anchor at Lifou. Straight up I will admit a soft spot for this beautiful uninhabited island. There is something about cruising into the area and seeing this tiny little island for the first time, which helps realign your perspective on life. 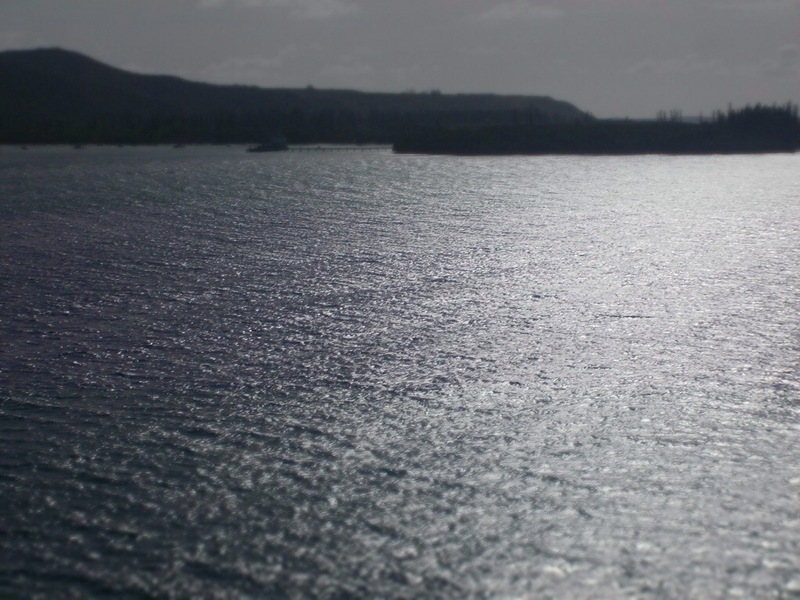 The sun combines with the aqua blue sea closely surrounding the island, to create gorgeous sparkling diamonds, dancing across the top of the water. Yes uninhabited, also taboo to stay on the island overnight, however there is an airfield running the length of the island. Perhaps not the most upmarket airport terminal around, but most certainly very cute! 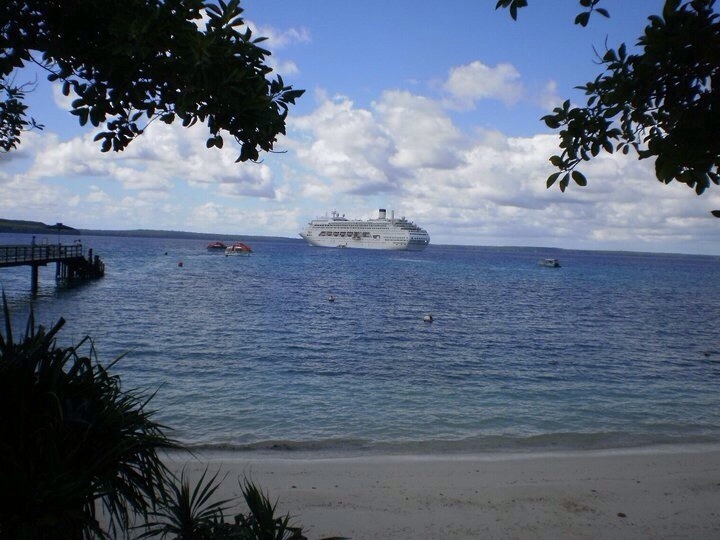 Ni Vanuatu travel by boat from nearby islands to sell their crafts and provide entertainment to cruise ship visitors. Permanent market huts are set up on the island to cater towards the visitors. Kindy children sit in their groups beneath the big shady tree branches, singing songs, while their curious eyes follow the ship passengers. You can tell when someone has stopped to listen, the volume of the singing increases, as the children throw all their enthusiasm into the songs. A delightful sound as you traverse the island. Photo opportunities with ‘cannibals’ are provided. I must admit a giggle at this cannibal who was having a heated discussion on his mobile phone during our stopover. Our second visit to the island was Christmas Day last year. 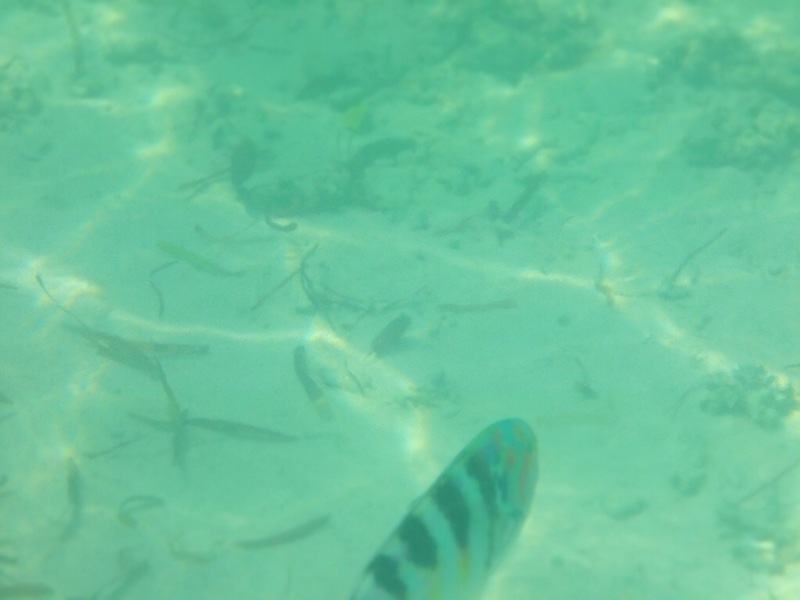 To spend Christmas Day snorkelling these beautiful waters was an incredibly relaxing experience. One of the hardest decisions for the day, do we walk round the island on the whiter than white sand, or wander down the middle, along the grass airfield. 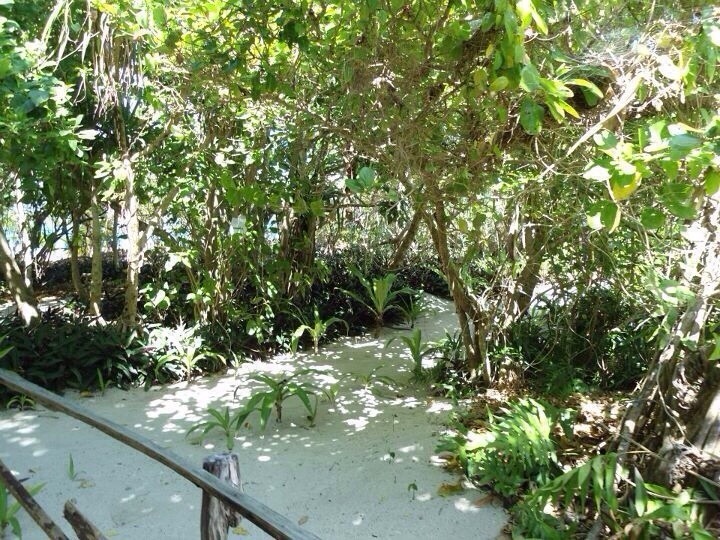 Sand tracks meandering through the shady trees thriving on the island, provide another option for exploring. A word of warning should you choose the airfield option, this airfield us in regular use, you may need to duck for cover as a plane comes in for landing. Even on Christmas morning, two flights arrived and departed, somewhat unexpected on an island like this. 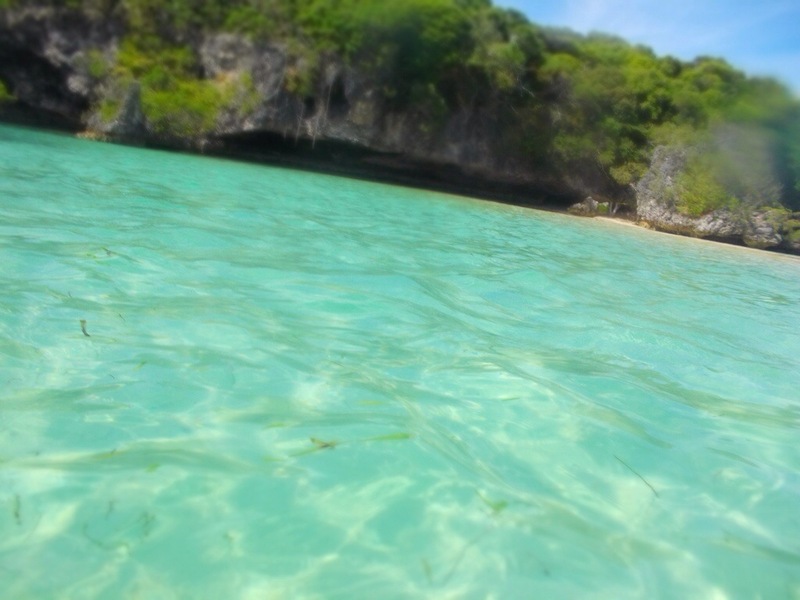 Definitely a place for snorkelling, you will no doubt find the beckoning of the gorgeous aqua sea, very difficult to resist. A nice quiet area is located down the opposite end of the island to where you land. Fewer people make the five-ten minute trek down there, preferring to stay close to the landing dock. 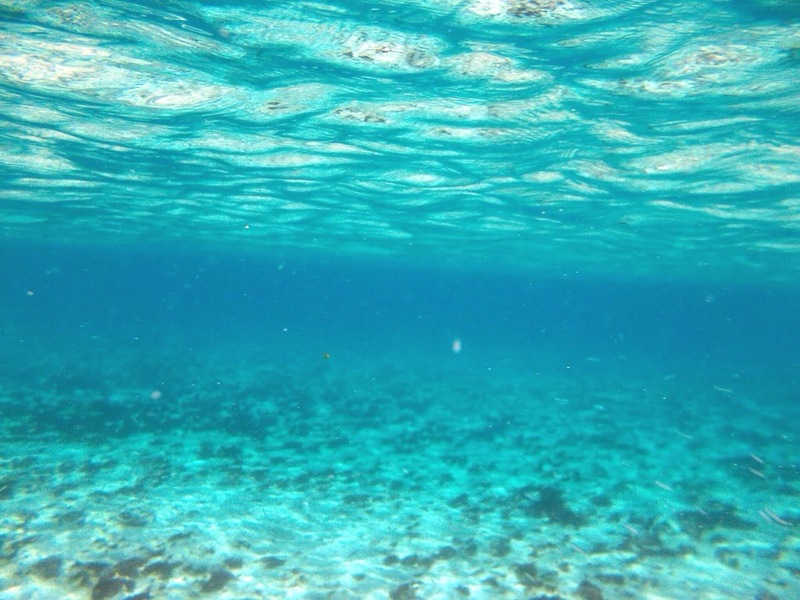 Leaving you to enjoy a peaceful uninterrupted snorkel. You may even find yourself in middle of a school of darting fish. 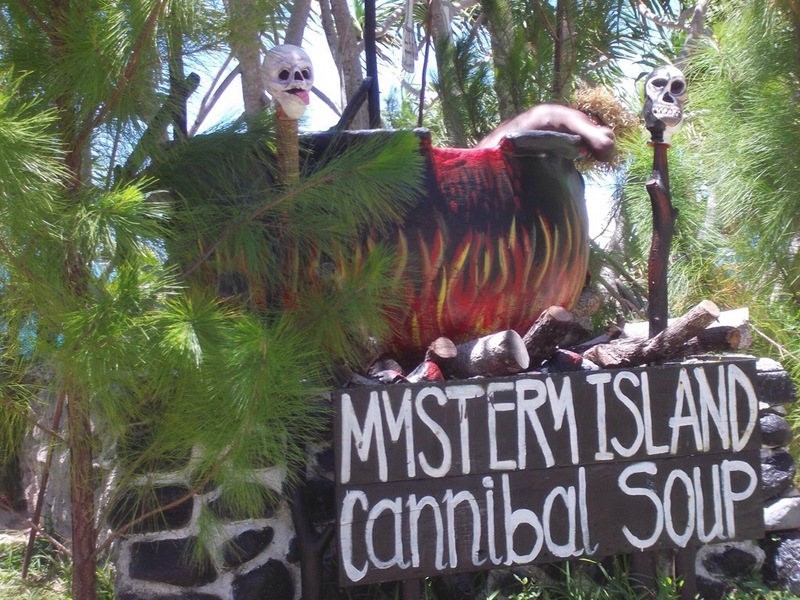 Be sure to take a cruise stopping off at Mystery Island, you won’t regret your decision.